The Fortune Theatre is a 432 seat West End theatre in Russell Street, near Covent Garden, in the City of Westminster, built in 1922-4 by Ernest Schaufelberg for impresario Laurence Cowen. The theatre is situated next to Crown Court Church and opposite the Theatre Royal. It was the first theatre to be built in London after the end of World War I. 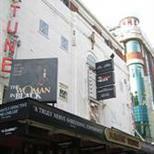 The theatre opened, as the Fortune Thriller Theatre on August 8, 1924, with Sinners by Lawrence Cowen. An author and playwright, Cowen commissioned the theatre in an Italianate style, that stands on the site of the old Albion Tavern, a public house that was frequented by Georgian and Victorian actors. Since 1989 the theatre has hosted the long running play The Woman in Black, which was adapted by Stephen Mallatratt from the book of the same name by Susan Hill. A celebration was held in 2001 to mark the 5000th performance. From 9 to 13 September 2008, the show was performed in Japanese by Takaya Kamikaya and Haruhito Saito, in celebration of the 150th anniversary of diplomatic relations between the UK and Japan The theatre was also used to record the Lily Savage video "Paying the Rent" in 1993, which was later broadcast by channel four in the UK in 1996. With 432 seats in the auditorium, it is believed to be the second smallest West End theatre. It was refurbished in 1960. The theatre's famous figurine, Terpsichore (perched high above the entrance) was sculpted by M H Crichton of the Bromsgrove Guild, a noted company of artisans from Worcestershire. The theatre was Grade II listed by English Heritage in May 1994. Since the demolition of the original Wembley Stadium, the theatre is now the oldest remaining public building designed wholly using concrete as a textured and exposed fapade. Take the Piccadilly Line to Covent Garden station and exit into the piazza. The theatre is approximately 5 minutes walk. All major London stations connect with the tube. Take the piccadily line to Covent Garden station. The venue is in the West End of London so it is advised to use public transport to get to the venue. Number 24, 29 or 176 to Covent Garden. There are no spaces for wheelchair users who have to stay in their chairs. The best seating option is generally the back of the dress circle level or Box A. Box A is accessible through a side fire exit, which has 5 steps. Wheelchairs and scooters will be stored in a safe place. The Fortune Theatre is equipped with a Sennheiser infra-red sound amplification system, available in all areas of the auditorium. To access the infra-red systems please request receiving equipment from the Box Office situated in the main foyer. There are two devices available: Induction Loop - Necklace Suitable for persons wearing a hearing aid, the induction loop necklace is worn around the neck. Whilst wearing the necklace switch your hearing aid to the 'T' setting and the sound is amplified. The necklace has an adjustable volume control. Headset - This device amplifies sound through earpieces similar to regular headphones. Suitable for persons without a hearing aid. Guide dogs are not permitted inside the auditorium due to loud sound effects. Staff are happy to look after guide dogs during the performance. For all Access info and Disabled bookings, please call 0844 871 7677.